Find the perfect London Bridge pub for your next drink. London Bridge is a mishmash of great bars, cool markets and (of course) The Shard. But what about pubs? Well, it has plenty of those too. Here are the best pubs in London Bridge for a swift (or not so swift) drink. Everyone knows that Britain is famous for its tea and its pubs – so a pub in an old tea warehouse is about as British as it gets. I’m talking about the Horniman at Hays, a Nicholson pub near London Bridge. The building dates back from the 17th century, when it was an esteemed tea dealer’s factory. It was eventually tastefully converted into a pub, preserving many of the character-filled elements such as a beautiful big antique clock. They have a classic British pub menu which has options from fresh salads to hearty burgers. There’s also beer and a generous selection of whiskey and gin to choose from. Visiting a historic pub is on just about everybody’s London bucket list, and it doesn’t get much more historic than the Grade I listed pub, The George Inn. It is the last galleried coaching inn in London, having hosted guests including Charles Dickens. So how old, is it? Well, that’s a bit of a loaded question. Although the current building was built in 1677, it replaced an older pub that was destroyed in a fire. No-one knows exactly how old that pub was, except that it was already on a map of the area created in 1543. Eventually, the invention of trains stymied business at The George. In fact, rumour has it that the former landlord haunts the pub, still infuriated at those modern trains! The food and beer are good – however the main draw here is the amazing history, which you’ll feel as soon as you enter. Conveniently, it’s one of the best bars near London Bridge station. If you’re looking for a friendly, family-run pub in the heart of busy London Bridge, you’ll love the Gladstone Arms. Despite its prized location – it’s one of the best pubs near London Bridge station – it retains the feel of a local in many ways. I love the regular calendar of live music, that features everything from Scottish folk music to electronica. There’s also a great menu serving Anglo-Indian fusion dishes, such as the scrumptious Tikka Masala Pie. Of course, it wouldn’t be a pub with a decent selection of beer. There’s an ever-changing list of local real ales and craft beers, as well as a range of wine and gin. 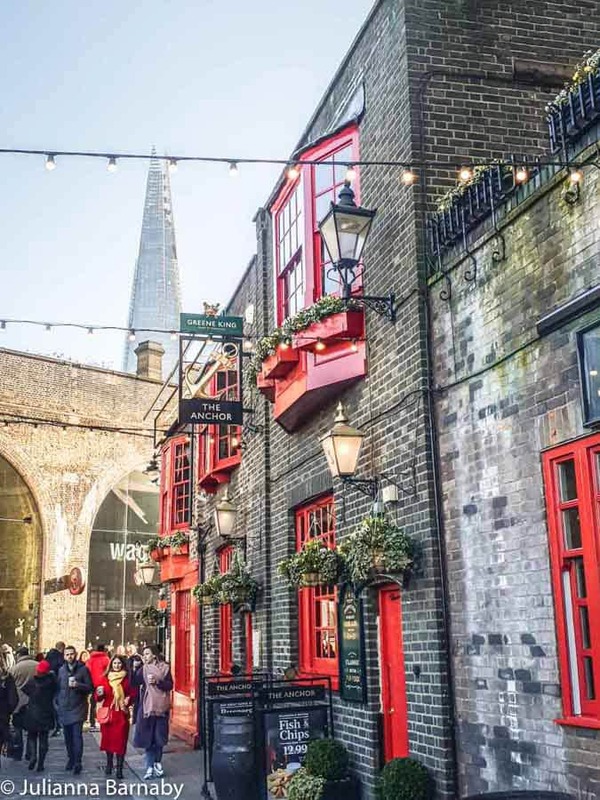 If you sink a pint in this charming London Bridge pub, you’ll be joining a very long list of punters who’ve enjoyed a tipple at the Anchor Bankside. After all, a pub has existed on this location for some 800 years. The venue is the last remaining riverside tavern left over from the days when London Bridge was the heart of the theatre in London, and actors would frequently drink there between shows. Its wooden interior and riverside location also made it a hit with river pirates and smugglers, who would hide their bounty in its walls. Today, it’s a friendly pub serving great pub food in London Bridge, with British classics including bangers and mash and steak pie. There’s also a wide range of drinks available, from real ales to martinis. This is London Bridge, so a pub with an outdoor dining space overlooking the Thames is always going to be a hit in my book. 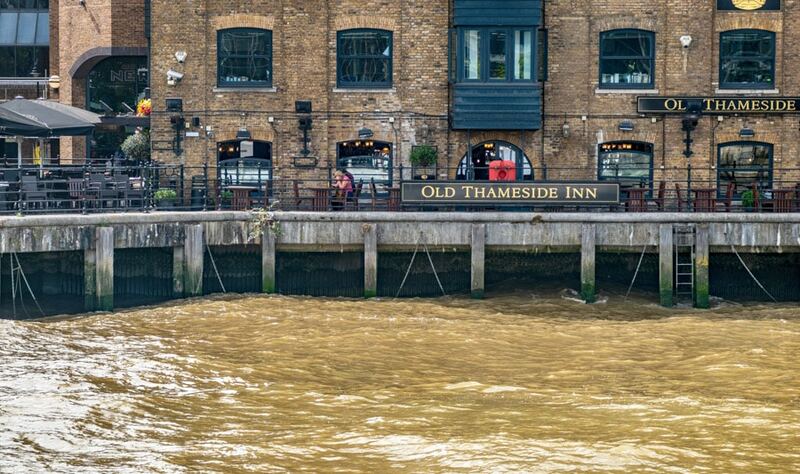 The Old Thameside Inn certainly delivers, with plenty of seating outside as well as indoors for when it’s chilly or rainy. A former spice warehouse, the remains of the once glorious Winchester Palace are just behind the pub and add to the overall atmosphere. A Nicholson Pub, it serves mostly real ales and lagers as well as a selection of wine and spirits. The menu is full of tried and tested classics like fish and chips and yummy desserts like sticky toffee pudding. The charming Mudlark is definitely my pick of the London Bridge Station pubs, thanks to its exceptional location and friendly ambience. Located just a stone’s throw from the tube stop, this is an ideal place to stop and enjoy some post-work drinks. There’s generous seating indoors under the beams, as well as an outdoor area that is particularly delightful in summer. Another Nicholson pub, the beer selection includes their house lager as well as a selection of others including craft beers. The menu is packed full of homestyle British classic comfort food as well as a generous selection of vegan and vegetarian dishes. There’s nothing like a pub that welcomes our four-legged friends too, and the Woolpack is certainly one of the most dog friendly pubs in London Bridge. In fact, it’s won several awards for the effort its put into making sure pooches feel just as welcome as their owners. 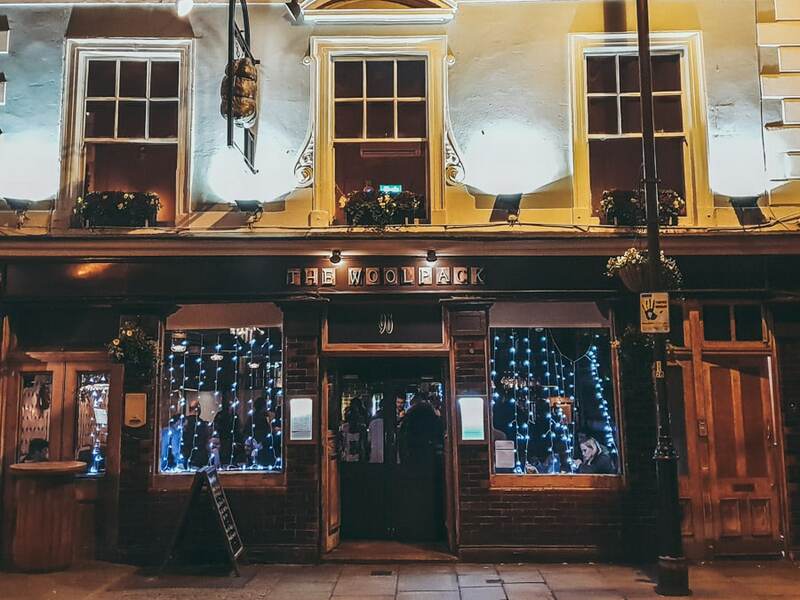 In addition, they have a cosy and welcoming beer garden that’s perfect for warmer weather, as well as a tasty menu that includes their signature Woolpack burger. They also do a mean full English breakfast for £10. During the day, it’s a great stop for a casual bite, while at night it becomes quite the party hotspot. Whenever you go, you’re sure to have a great time – and probably meet some cute pups, too. There’s plenty of old school boozers in London Bridge, but I love the Rake and its decidedly different approach. When I say it’s cosy, I mean really cosy – after all, floor space comes at a premium in London! There’s a modest indoor area and bar, as well as a slightly more spacious (but certainly not palatial) beer garden out the back. If you’re a beer drinker, then this is one of the best pubs in London Bridge. It’s the absolute focus of The Rake, since its owned by Utobeer, beer specialists who started out with a stall in the nearby Borough Market. You’ll find a dazzling selection of beer, with an emphasis on American craft beer. The menu is always changing and there’s only one rule, as expressed by the sign above the bar: “no crap on tap”. 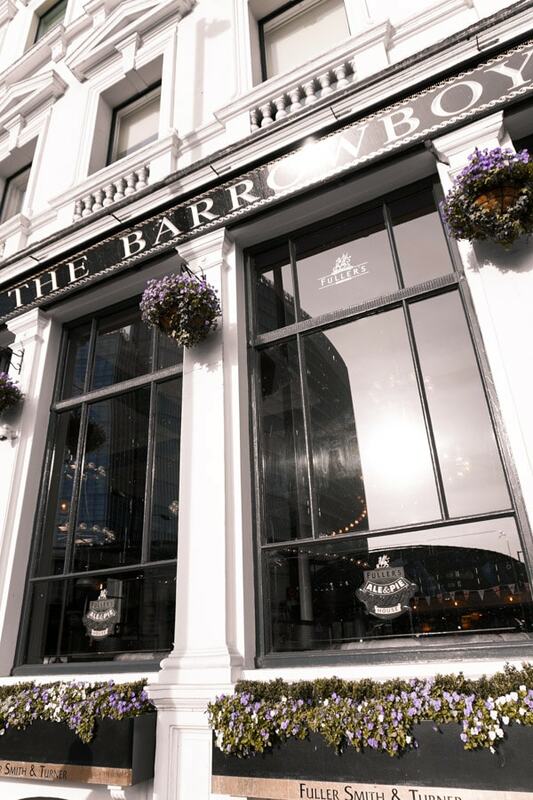 It’s a little more glitz and glamour than your usual London watering hole, so The Barrowboy & Banker is perfect for a special occasion. Of course, sometimes that ‘special occasion’ is simply that you’re in the mood for a good pint. This pub is inside an old bank, and even though the pub underwent an extensive renovation in late 2017, they kept many of the original features including some charming rustic bank vaults. The renovation also saw on overhaul of their menu, although it still focuses on dishing up a great pie & pint. In particular, lovers of craft beer and gin will be spoiled for choice by the menu. Best of all, most seats in the pub have a gorgeous view out over Southwark Cathedral. Not a bad view while you enjoy your beer! While some trends come and go in London, others stick around – take the concept of a “beer house”, for example. Dating back from the 19th century, beer houses were informal haunts (often run out of a family home) serving up ales and lagers. Dean Swift is true to this style of venue. They have a great selection of beer, with a particular emphasis on craft beers such as the hoppy London Brewing Co Upright Indian IPA. There’s also a number of handpicked wines available if that’s more your style. As a great gastro pub in London Bridge, the menu is delicious and diverse, with options including gnocchi with wild mushrooms and tarragon sauce, to steak cooked to perfection. An American style diner serving British ales and lagers might not sound like it works – but luckily for the Draft House in London Bridge, it really does. This is one of the friendliest good pubs in London Bridge, and it proudly welcomes everyone whether you’re a fifty year veteran of London or a blow-in from abroad. The decor is distinctly Americana with bright leather seating, while the menu is also inspired by our neighbours across the pond – think favourites like burgers and wings. On the other hand, the selection of ales and craft beers is just what you’d expect from a British haunt. The menu changes regularly and there’s even cider and non-alcoholic beer on the menu. London has long been a melting pot of cultures and cuisines, and that’s definitely what’s on offer at London Bridge pub MC & Sons. In the English capital, you’ll find this traditional Irish boozer serving up a Thai menu and a selection of international beers. Forget having a heavy steak pie to accompany your Guinness, MC & Sons menu is authentically Thai – specifically, from Chiang Mai in the country’s hilly north. The cuisine is particularly unique, and well-known from its finely balanced fresh flavours – with more than a bit of a spicy zing. The decor is all Ireland, however, with a moody wooden interior. The beer on tap is a bit of a blend, there’s Guinness (that goes without saying in an Irish pub), but there’s also the Thai offering, Singha. I love it. Nestled in the Borough Market, the Globe Tavern is a friendly place to rest your legs if they’re tired out from all that shopping. The exterior of the building is Gothic and brooding, while things get much more airy and breezy once you step in through the door. The pub was recently renovated and is modern and stylish. For awhile it was believed to have been built on the site of Shakespeare’s “The Globe” theatre. While that’s been debunked, the name stuck, and it does have at least one artistic claim to fame – it was the pub Bridget Jones lived above in Bridget Jones’ Diary. This is a gastropub serving tasty British classics, and there’s also a good selection of drinks including the Borough Market Pale Ale, which is fitting. 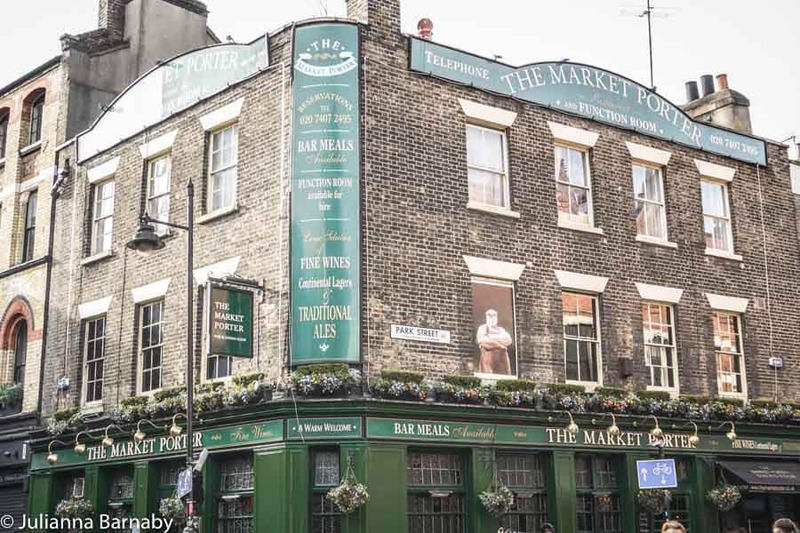 With colourful flowers cascading down its exterior, the Market Porter is surely one of the prettiest pubs near London Bridge. The pub is proudly British, offering up beer, cider and wine from classic labels like Guinness and Aspall Cider. There’s also a generous wine list, sourced from all over the world. The food is particularly exceptional, offering British classics with a twist, like the mouthwatering grilled sea bass or the fancy take on the classic Scotch Egg. 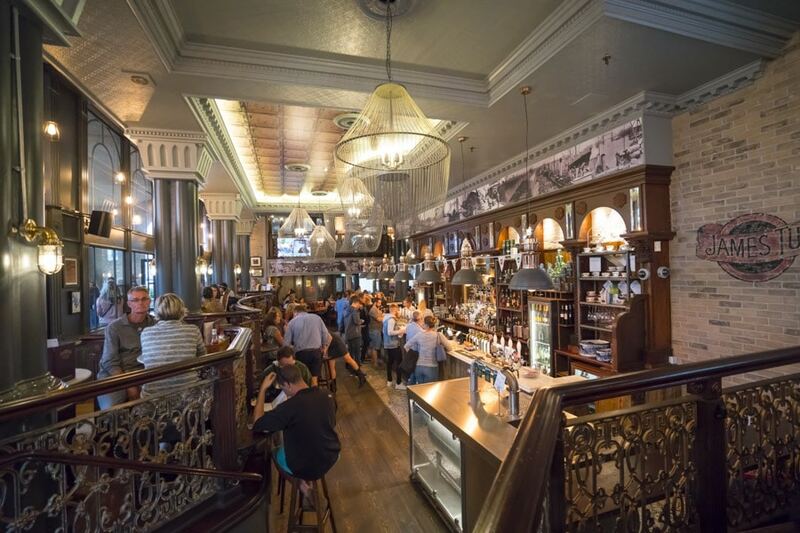 Overlooking the Borough Market, you certainly feel like you’re a part of the fabric of London as you sink a pint in this gorgeous London Bridge pub. Click here for a map of the pubs featured in this article.